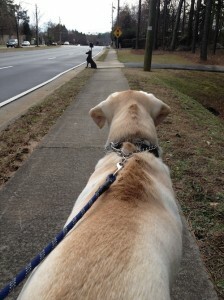 Our family was on a long walk this week when our dog, Mack, stopped short and started growling. Mack is, by any measure I know, the happiest dog on the planet. Unlike our previous Labrador, who was an Alpha Male, Mack is content to be the last in the pack. He will submit to a puppy or a Yorkshire Terrier. This made his growl noteworthy. We stopped in our tracks and watched him back up and pace nervously. He had seen something up ahead and wasn't excited about continuing the walk. The hair on his back was up and it was up to us to figure out what was bothering him. Finally, we noticed the mailbox with a cutout of a dog 200 yards in front. A big, black, scary dog who happened to be a wood cutout. Gradually we inched forward to show Mack that not only would the dog NOT hurt him, but that it wasn't a dog at all. After the awkward introduction, Mack walked on past as if his nervousness never existed. I couldn't help but think worry does that to all of us. We see dark shadows on the path in front of us and instantly our hackles are raised and we spend all kinds of energy wondering "what if" such and such happens. We fret and pace and end up spending lots of time worrying about our path rather than just walking it. Fear can make fools of us all. This year, like Shakespeare's Cymbeline, I say, "Boldness, be my friend."